To get the best out of your pelvic floor exercise we recommend you choose the following pelvic toner probes, kegel exerciser lubricants and accessories. 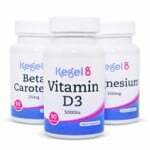 Which Kegel8 Is Right For You? Which Probe Is Right For You? Offer ends midnight 30/04/2019 and does not apply to postage. Cannot be used in conjunction with any other offer. Want it delivered by Tuesday, 23rd Apr? Order within and choose Special Delivery at the checkout. What is Kegel8 Klean for Men and why should I use it? Kegel8 Klean for Men is an antibacterial spray designed to keep your Kegel8 V For Men pelvic toner, probes and accessories clean and bacteria-free. 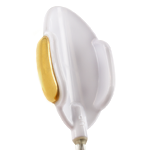 Simply spray on to your probe or pelvic toner and either wipe with a tissue or leave to air-dry. It's important to keep your probes especially clean to avoid any risk of infection, and Kegel8 Klean for Men makes it easy - the simple-to-use spray kills 99.9% of surface bacteria for the most hygienic exercises. The spray is safe to use wih all Kegel8 probes and pelvic toners. Why should I use it? Your probes and pelvic toners need to be kept clean to prevent any risk of infection. Kegel8 Klean for Men kills 99.9% of surface bacteria for clean and hygienic exercises. For best results use both before and after exercising. 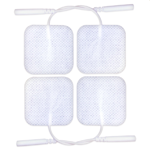 Cleanses all Kegel8 devices and probes, before and after use. Are you ready to start your Kegel8 journey to a stronger pelvic floor right now? Order before 3.45pm Monday to Friday and your order will be dispatched the very same day. As some of our products are of an intimate nature. Rest assured that no one, other than you, will know what is contained in your delivery. We use plain brown, unbranded, boxes. Keeping the contents secure and private. If you're not 100% happy with your purchase and you have not opened or used any of the intimate products, and everything is in a re-saleable condition, you can return them for FREE within 14 days of delivery to get a full refund. Speak to our Customer Care team if you have any questions. If you have any questions about our products or your pelvic floor, please pick up the phone and speak to one of our Kegel8 experts. Our Customer Care team have over 10 years of customer service experience, helping you make the best decision when it comes to your intimate health. Call us on 01482 496932. Our Customer Care line is open 8.00am - 6.00pm GMT, Monday to Friday, 9.00am - 3.00pm GMT, Saturday. If phone calls aren't for you, then our live chat is also available on our website 8.00am - 6.00pm GMT, Monday to Friday, 9.00am - 3.30pm GMT, Saturday. Or visit our contact us page to use our contact us form or email. Have you already brought from us? We're still here to help! Let us know how we can help and we will endeavour to answer any questions you may have. The cardboard boxes we use to deliver your goods are made of over 70% recycled materials, the rest is made from pure Kraft from managed sources. Please recycle our packaging to continue the cycle.